Oh…I think I get it. | Love Yourself Through It! Oh…I think I get it. So, this morning I was having a cup of coffee….a really good cup of coffee in my favorite “life is good” mug. I was also eating a bagel and thinking about my upcoming Zentangle class. I was thinking about what I needed to get done to be ready for the class and chewing, chewing, chewing ( you know…bagels and all) and then suddenly it hit me. I totally get the whole life imitates art epiphany of Zentangle. You can gettem like dis. You can gettem like dat. You can do it like dis. You can do it like dat. 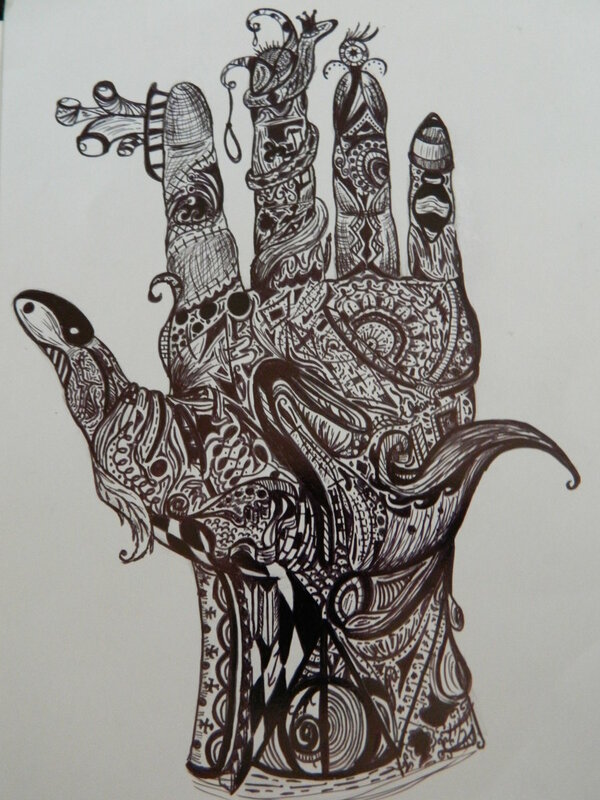 Zentangle is the art of doodling. Doodling to get into a zen like state. Reconnection with your higher self while distracting the analytical mind. A way of reconnecting the two sides of your brain. But, best of all…mindfulness. By mindfulness, I mean being in the present moment. You aren’t thinking backward to the past. You aren’t thinking forward to the future. You are simply being in the exact moment during zentangle. 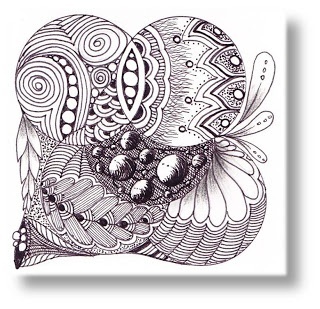 Zentangle has a motto – ” Anything is possible, one stroke at a time”. I know…I went to the trashy place right away. But, if you can put your giggling teenager away for just a moment and think of that statement with me. I know it sounds like the” one step at a time” or the “one day at a time, sweet Jesus thing”…but there is more meaning in that statement than I originally got when I first read it. 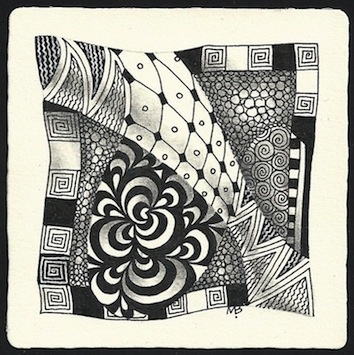 In the teaching of Zentangle they say that as you begin with simple patterns, and really doing them one stroke at a time ; you will begin to notice patterns in the world around you. That’s when the big ” AHA” moment came. There are patterns in everything. People have patterns. There are behavior patterns. There are cycles in life and those cycles have patterns. Some patterns are great and I love those things about being me. There are also patterns that I don’t love so much, and they seem really overwhelming to think about fixing. 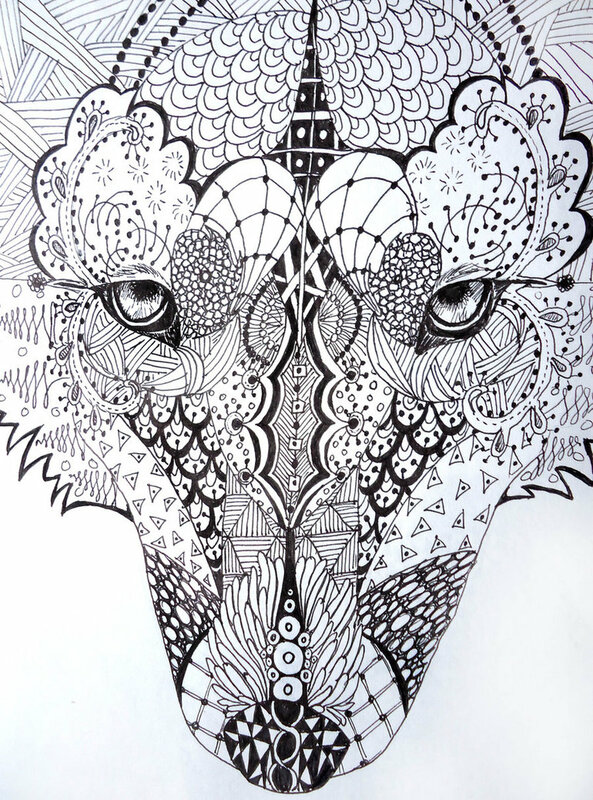 If I apply the Zentangle approach to those patterns, like I would a drawing….just by altering one stroke….just adding something, in a mindful way…or maybe subtracting something…one thing at a time….just concentrating on that one thing…..just one…. One single change. One small alteration can change the whole picture. When I am comfortable with that alteration, perhaps I can move on to a different stroke. If it doesn’t work…it isn’t a mistake. It’s just an opportunity to do something a little differently. There are no erasers in life, There are no erasers in Zentangle. Life is a tangle. If we throw a little bit of Zen in the mix….who knows what artistic masterpiece we will create. Today I agree to alter one stroke. I can get into that. It feels respectful, and gentle, and very love filled. I felt a little empowered by it. Yeah…I’m digging this.